We’ve just released our seventh chapter in the RNL Advancement Leaders Speak series, where we ask you, the fundraisers about your challenges, successes and best practices. This release is focuses on annual giving multichannel strategy – or how we contact annual giving donors through all the various fundraising channels. The report revealed some interesting things about how annual giving is judged and evaluated by institutions, how fundraisers are timing appeals, and what we feel are the best ways to capture, retain and upgrade donors. You can download the full survey at ruffalonl.com. I got on the like with Shad Hanselman, RNL’s annual giving guru, to talk about the survey and what it means for fundraising strategy. 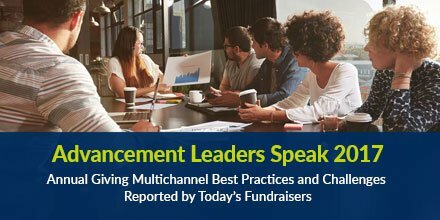 Looking at the results of this survey of 300 fundraisers, it does look like there are some opportunities to optimize our multi-channel outreach to donors. As Shad mentioned, making your appeals work together like a symphony will really help engage donors. This takes technology, and careful analysis of your results, two things that fundraisers wanted to be utilizing more.